What happens in 1959 when you are building a house, and you are a plumber, and your brother, a tiler. You end up with three — count ’em: Three! 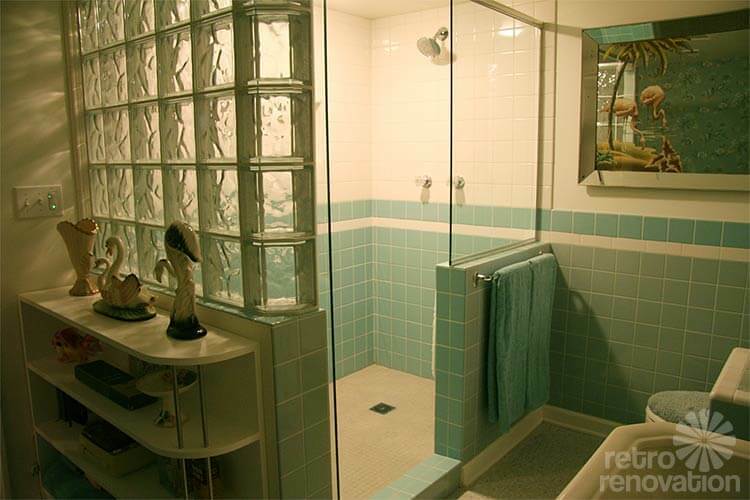 — close-to-original condition, lollipop-pastel-colored tile 1959 bathrooms in your house. Carolyn is just the second owner of this treasure chest, and she isn’t changing anything. 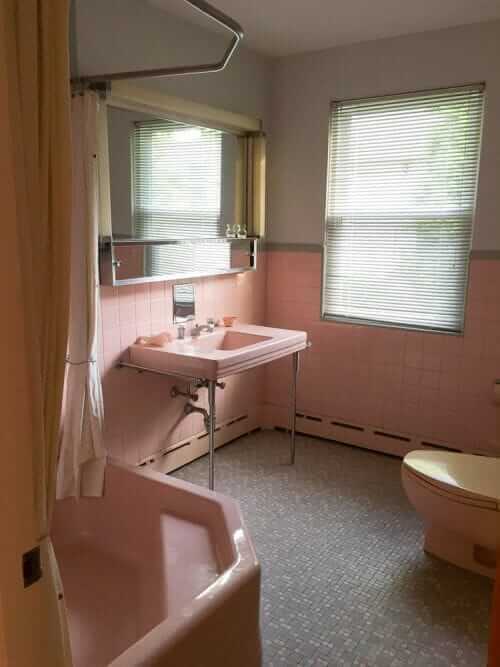 Yesterday we looked at Carolyn’s amazing pink bathroom — oh, that Cinderella! Today: her blue bathroom, vintage wallpaper still intact. 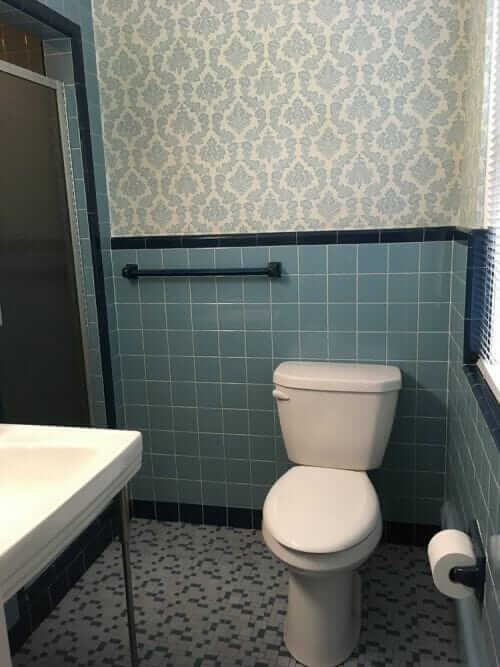 Nearly-original condition: There appears to be a newer toilet, and it’s possible the wallpaper is newer — although it may well be original — and all that said: It all looks so very well maintained! 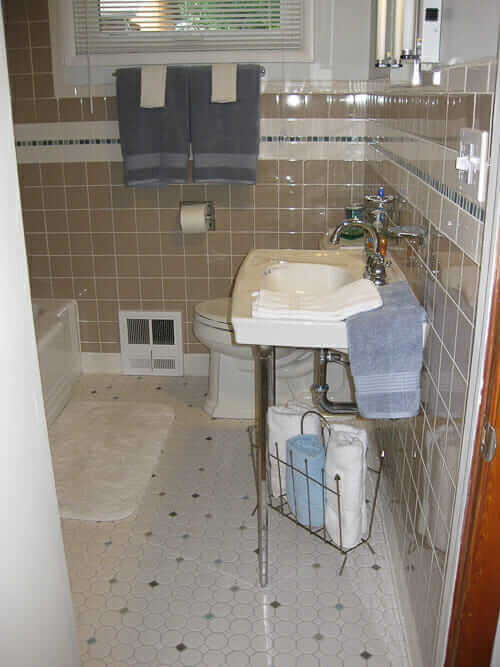 I also spy: A Hall-Mack Revolving toothbrush holder aka “Concealed Lavatory Unit”. I really am lucky! Just for the heck of it, here’s the blue bathroom. The main treat here is the three extra nozzles which squirt you in the middle. I imagine these aren’t too common in 1959 unless you happen to be getting a house dreamt up by a plumber. Just to round out my palette, I also have a yellow powder room. So lucky! Thank you for sharing, Carolyn! Gorgeous! 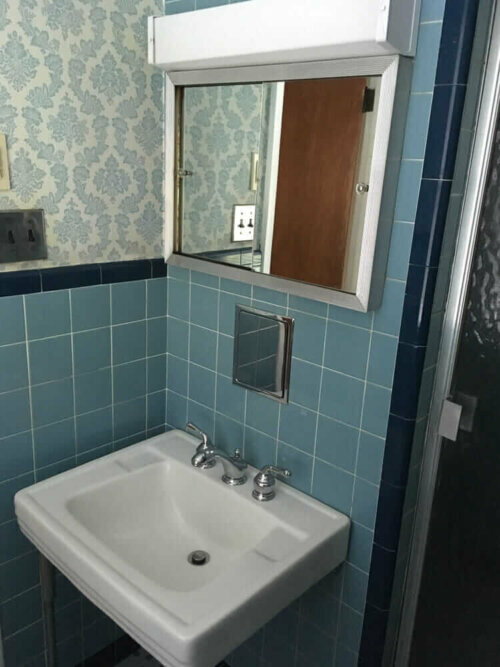 Need help with your vintage bathroom — want to create one of our own — or just want to see more? 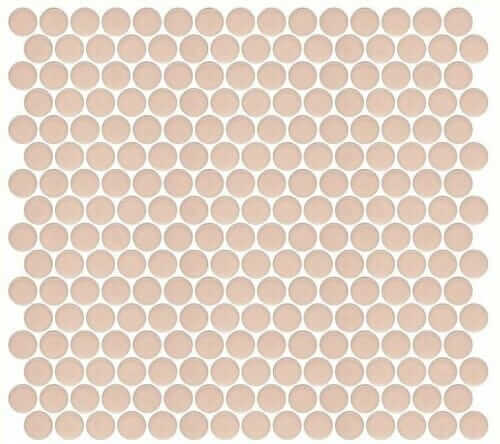 See all my Bathroom Research here. I love love love the blue bathroom!!!! Yay, another three bathrooms saved!!! I have used Zap! 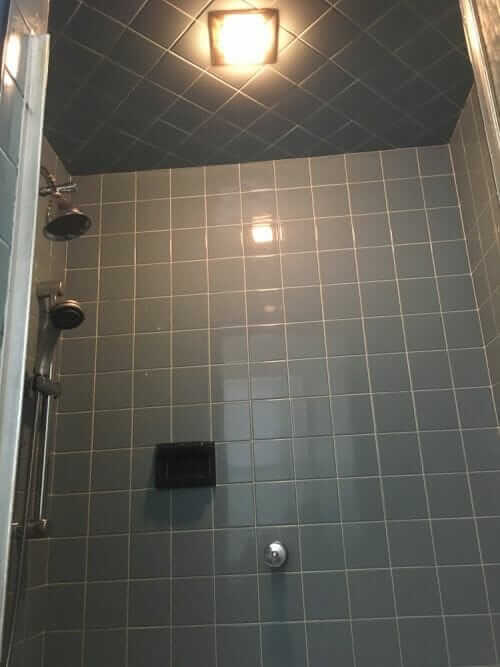 Professional Tile and Grout Restorer for grout, and it works wonderfully. 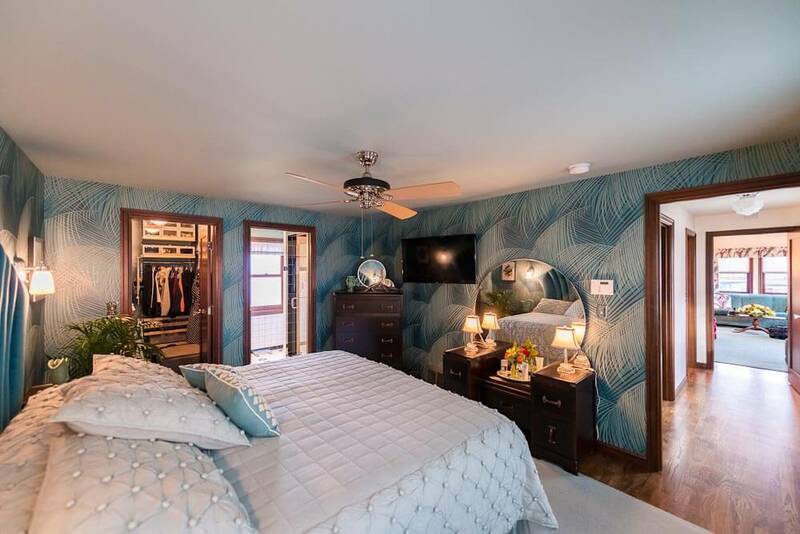 Thanks for the pictures of the blue bathroom, it’s so pretty! I can’t wait to see the kitchen, please share some photos! Congratulations on your find, i love your story of how you got it! ??? ?